You probably already know this, but just in case: In Settings → Location access, activate GPS satellites (on/off switch), then click on GPS satellites. Here, activate EPO assistance & A-GPS. Enter A-GPS, click Network Request. 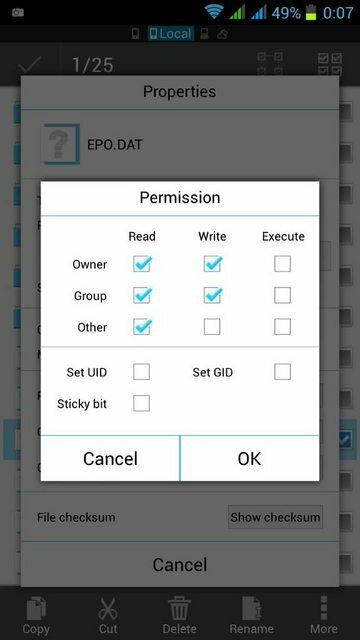 Enter EPO settings, click Auto download, then Download at the bottom. Download completed? Congratulations! This means that you can skip this step: your GPS now has data about the GPS satellites' movement across the sky for the next 30 days; the system will try to get new EPO files every 15 days, so that the information never gets outdated. Start EngineerMode (Dial*#*#3646633#*#*) → Swipe to Location → Location Based Service → EPO. Under EPO functionality, click EPO (IDLE) to start the download. You don't have to delete the old EPO-files before downloading the new ones. You can also set how often you want your phone to download the new files under update period setting; since MediaTek updates them once every 24 hours, I've set mine to 1440 minutes. Then it should be possible to insert the files. The properties of each files need to be set like this. If you cannot access the server through EngineerMode or FTP, check our thread in the forum; if the server is unstable or down, then somebody will usually mirror a version of the latest EPO files. Install the module GravityBox (allows various changes throughout the Stock Android interface, as well as a few fixes). Not on the wiki yet. See this post on the XDA Fairphone thread. First, check if you need to do this. If you just want to move app data of a single application to the internal data partition to free space, you can do that via app settings in the menu bar. Choose the app you want to move, tap it, and choose "Move to Phone Storage". If you want all future apps to store their data on the internal phone storage, go to System Settings > Storage > Preferred install location, and choose "Phone Storage". If you however want to repartition your device, remember the risks. These instructions are for the first batch model (December 2013 / January 2014) without the unified storage upgrade applied. Don't worry, the next screen should show you a dead android saying "no command"
Credit goes to mrueegg and arghwhymustiregister. Install the Framework, launch it, go to the Framework section and choose Install/Update - then, reboot. Open Xposed, go the Download section and search here for GravityBox [JB] - install it. In Auto-hide signal icons choose both Auto-hide SIM Slot 2 and Disable notifications. This how-to is assuming you have already flashed Fairphone Stock Android on your phone. Where did I get this file? After flashing AOSP, I hunted the web for a fitting Google Apps package (gapps.zip), but neither gapps-jb-20130812-signed.zip (serving Android 4.2.2) nor any other would work. However, when you first start the Google Apps installer under Fairphone OS, it temporarily downloads a googleapps.zip to the phone's storage. It is deleted right after installation begins, so I simply started the installer, waited for the download to finish, enabled USB storage, and copied it before it got deleted. Install the Yalp Store from F-Droid. On Windows: Download this .bat file into the same folder as Android Checkin and execute it. After that go to your System settings and click on Add account in the ACCOUNTS section, choose Google Play Account and enter your prior used mail, password and the generated ID. Original reference. The Serial number of FP1 is initially set to 0123456789ABCDEF. You can use XPrivacy after installing the XPosed framework to fake a valid serial number (might be needed for some apps). Change the default 'DEFACE' serial number to the relevant serial number. Don't select the check box in front of the number (as it will give you a randomised serial). Make sure Identification/Serial is still selected (otherwise the problematic serial will still show). Leave XPrivacy and reset the data Navigon app (Settings > Apps > Navigon > Clear data). In the troubleshooting forum one user trying to get navigon to work reported a bootloop that they think was caused by using an XPrivacy based approach. Just in case, it may help to be familiar with disabling XPosed from recovery if things do go bad. Download the operating system you wish to install. The original Fairphone ROMs can be found here. So you ended up here? That's a bummer! But if you just go for some air, perhaps a walk or some coffee it will be alright when you come back. Also know that not all hope is lost and there is a way forward. Of course everything will be deleted from your phone, but you had a backup, right? First you need to download a few things to your computer. Tools in this guide are for Windows/Linux (for Windows 8 look here). If you find a method that works for other platforms, please add that information. SP Flash Tool (Linux) is used to write binaries to the phone. Use the latest version (5.x), not the 3.x. On older Windows versions you also need the Windows driver for Mediatek 6589 (rar file, beware of adware). It is not signed so be prepared for whiny Windows. Windows 10 (and possibly 8) downloads the correct drivers automatically. So when everything is downloaded, install the drivers (optional on newer Windows versions). Unpack the SP Flash Tool and the Fairphone binaries. Go ahead and press the download button in SP Flash Tool. After under 2 minutes a popup with a green check mark should appear, telling you that SP Flash Tool is finished. If you get the error "PMT changed for the ROM: it must be downloaded", simply change the dropdown in SP Flash Tool from "Download only" to "Format + Download".